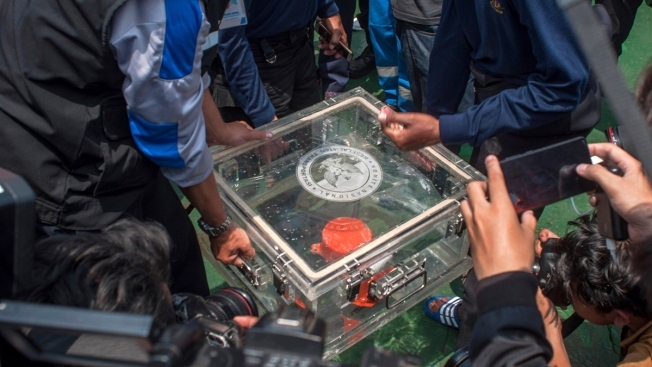 In this Thursday, Nov. 1, 2018, file photo, members of the National Transportation Safety Committee lift a box containing the flight data recorder from a crashed Lion Air jet onboard a rescue ship anchored in the waters of Tanjung Karawang, Indonesia. Lion Air pilots struggled to maintain control of their Boeing jet as an automatic safety system in the aircraft repeatedly pushed the plane's nose down, according to a draft of a preliminary report by Indonesian officials who are looking into the deadly crash. Faulty equipment and Indonesian carrier Lion Air's own safety failures had pilots fighting for control of their Boeing 737 MAX 8 as it plunged into the Java Sea on Oct. 28, killing all 189 people aboard, investigators said Wednesday. Briefing reporters on the aircraft's black box data, the investigators said they were still struggling to understand why the plane crashed but they cited multiple factors centered on faulty sensors and an automatic safety system that repeatedly forced the plane's nose down despite the pilots' efforts to correct the problem. The pilots simply may have been overwhelmed, said one of the crash investigators, Ony Suryo Wibowo. "The problem is if multiple malfunctions occur all at once, which one should be prioritized?" Wibowo said. The brand-new Lion Air jet that crashed shortly after taking off from Jakarta is a Boeing 737 that went into service three months ago. The lack of the aircraft's cockpit voice recorder, which is still missing, is a dire obstacle to resolving that mystery, the investigators said. The report by Indonesia's National Transportation Safety Commission repeats earlier recommendations made just after the disaster that pilots be better versed in emergency procedures and aware of past aircraft problems. Shortly after the catastrophe, Lion Air issued a notice to pilots urging them to be more proactive in reporting problems. Nurcahyo Utomo, an investigator for Indonesia's National Transportation Safety Commission, told reporters in Jakarta on Wednesday that four of the crashed aircraft's previous flights had experienced technical problems, with two showing no such difficulties. He said investigators were trying to understand what maintenance workers had done to try to fix the problems and if there were other steps that should have been taken. The MAX aircraft that crashed is the latest version of Boeing's popular 737 jetliner. Its new automated system pushes the nose down if a sensor detects that the nose is pointed so high that the plane could go into an aerodynamic stall. The sensor, called an angle-of-attack vane, or AOA, malfunctioned in earlier flights. Pilots who flew the aircraft from Bali to Jakarta a day before the crash told investigators that the anti-stall system engaged due to erroneous airspeed and altitude indicators, but the flight crew managed to adjust the plane's pitch manually by shutting the automated system off. That enabled them to restore control and land safely. Utomo said it was unclear why the pilots on the flight from Jakarta to a regional airport the next day were unable to do the same. "Even if the pilot did not have time to meet with the engineer, he should be able to know what the problems experienced by the aircraft before," he said. 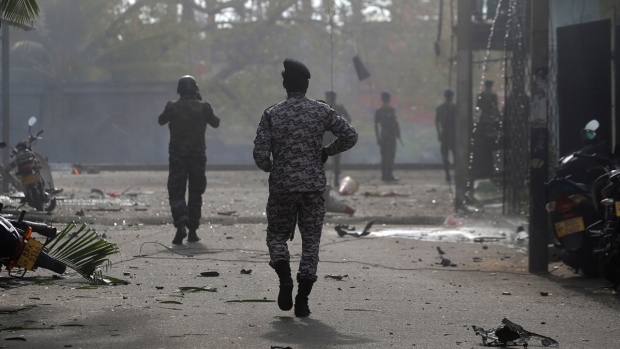 "We need to find out what happened and why the pilots took different actions. That why we really want to have the cockpit voice recorder." In a statement following the release of the report, Boeing played up the possibility of pilot error. "As our customers and their passengers continue to fly the 737 MAX to hundreds of destinations around the world every day, they have our assurance that the 737 MAX is as safe as any airplane that has ever flown the skies," it said. The aircraft manufacturer noted that the investigators' report cited actions by the flight crew that led to the crash. It also pointed to maintenance work and procedures that had failed to fix the aircraft's repeated problems. Peter Lemme, an expert in aviation and satellite communications and a former Boeing engineer who wrote an analysis of the data on his blog, likened the problems to "a deadly game of tag" in which the plane pointed down, the pilots countered by manually aiming the nose higher, only for the sequence to repeat about five seconds later. That happened 26 times during the 11-minute flight, but pilots failed to recognize what was happening and follow the known procedure for countering incorrect activation of the automated safety system, Lemme told The Associated Press. Lemme said he was troubled that there weren't easy checks to see if sensor information was correct, that the crew of the fatal flight apparently wasn't warned about the problems on previous flights and that the Lion Air jet wasn't fully repaired after those flights. "Had they fixed the airplane, we would not have had the accident," he said. "Every accident is a combination of events, so there is disappointment all around here," he said. The Indonesian investigation is continuing with help from U.S. regulators and Boeing.